As always thanks for following along with my creative endeavours! I've had so, so, so much fun the last little while sewing up some crazy fun things but haven't had much time to post about said fun things. My valiant and trusty MacBook of 5 years suddenly deciding it doesn't want to stay on for more than 20 minutes at a time hasn't helped with this. Oh technology. I'm stealing some screen time elsewhere until I can come up with a solution to my computer woes. Anyway, I wanted to share a few quick photos of some fun things I've made for my lovely friend Chantel Hilton! This gal is crazy creative when it comes to her style so she always has some fun ideas to bring to her designer pals. I'm very glad to be one of them! She literally is like a life size barbie doll. I promise you she's way smarter and way, way more fun than her plastic counter part though. No offence Barbie. Last summer we literally copied a page out of Barbie's handbook by making a homage to her infamous 1959 bathing suit! This is actually the second version I've made of this. The first one was a Halloween costume a few years back and though it did turn out super cute I was a bit nit-picky about two things; The fit, and the fabric! The fabric was a polyester knit which I knew was not ideal for the structure I wanted to bring to it, but it was the only black & white stripe we could find in time for Halloween. The stripe, as you can see in the photos below, is far more narrow than Barbie's suit would have been. Obviously, the scale is much different but even so I would have preferred something wider. It also would have made matching the stripes easier! I remember many late nights leading up to Halloween painfully matching every stripe by hand basted stitches because no matter how many pins, or how slowly I sewed with my machine, they always jarred slightly off balance. The rage! The sleep deprivation! And the relief when I finally accepted the fact that it would work perfectly with a little patience. The top was also cut a tad lower than I would have liked, and the shorts were a touch longer too, but it was all in good fun for Halloween so we rolled with it. Ages later though, I stumbled across a gorgeous black and white stripe cotton twill. It had a lovely slight sateen to it and just the ittiest bit of stretch. Perfect pant weight actually, but I immediately knew when I saw it that THIS was the fabric I wish I could have found for the Barbie inspired play-suit. I mentioned this to Chantel and she was totally game for a 2.0 version! I made a few pattern adjustments to account for the new weight and stretch of the fabric and then oh so carefully notched and cut the fabric to create the iconic chevron shape. It was cut on the bias to achieve this look and although I had a few stresses lining up the stripes it worked far better than the first round. The only difference we made between our version and the 1959 Barbie is the cut of the leg. We opted for a boy short instead of a traditional bathing suit cut. Chantel clearly channels her inner Barbie when she wears it. I'm so happy with how this turned out and am glad we re-made it using better quality fabric. Next up - VIVA LAS VEGAS! Have you heard of this? It's more commonly referred to simply as "Viva". It's a huge car show that takes place every April in Las Vegas and has become a major hub for rockabilly and retro enthusiasts from all over. It's also something of a fashion event too with guys and dolls taking their unique style to even more grand proportions. Chantel knows and relishes this. Remember that sweet red fringed outfit she wore to our Beach Blanket Bingo outing? She had another 3 fringe outfits commissioned by Hand Cuffs Required for this very event. And man did they look stunning! 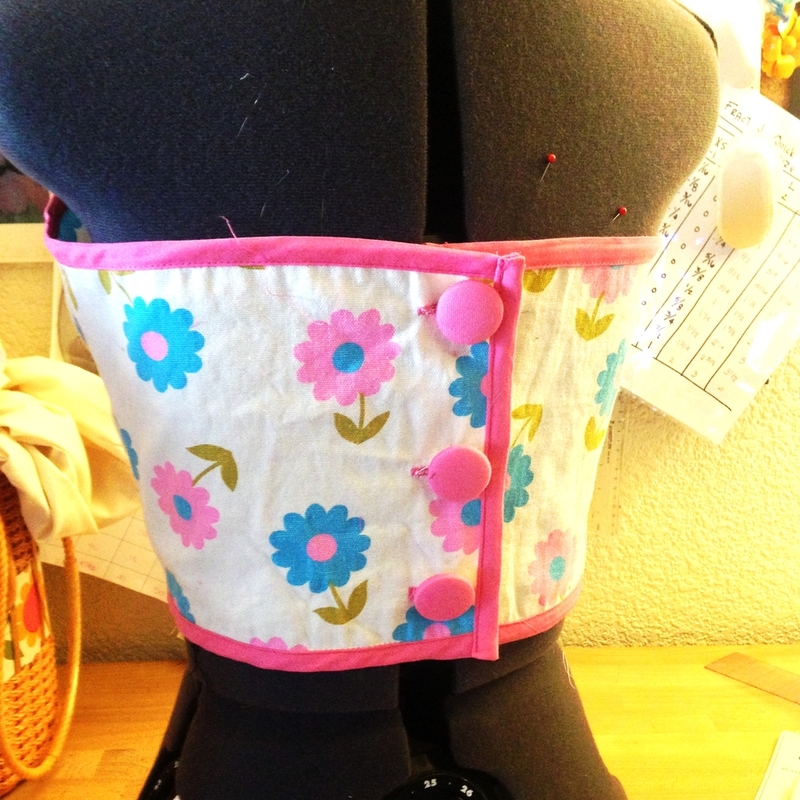 She also called upon me to sew up a cute little summer outfit using this adorable floral vintage fabric. Straight out of the 60s vintage. I sketched out a few ideas and ultimately decided on a bullet style top. Chantel has these amazing custom built bullet bra's from Sweet Carousel Corsetry (how awesome is Edmonton's design scene that you can get lingerie custom made?!) so I knew that whatever I designed had to compliment this shape. I'm really happy with what I came up with! It fit over the bullet bra beautifully and made for a super cute outfit when paired with a mini skirt made of the same fabric. Over the next little while I plan to take a step back from custom work and focus more on ready made attire and other creative projects but I feel like this play suit might have to be part of that ready made rotation! If you're interested please let me know and keep an eye on my etsy shop. Runway photos are from Western Canada Fashion Week, and all other shots are mine and Chantel's candid's.